300 million mobile phones are currently active in the U. S. By the end of 2011, more than half of those are expected to be smartphones. Getting to know your patients and their online behaviors is essential to successful website performance, especially as more and more of your patients access your site from their mobile device. Do you know the average age of your patients? Are they looking for your site from their smartphone? We can gain some deeper insight into these two questions by comparing the results of a recent study from comScore, Inc. to the annual statistics from the American Society for Aesthetic Plastic Surgery (ASAPS). According to the latest study from ASAPS, patients age 35-50 account for the greatest number of cosmetic enhancement procedures in the U. S. at 44%. 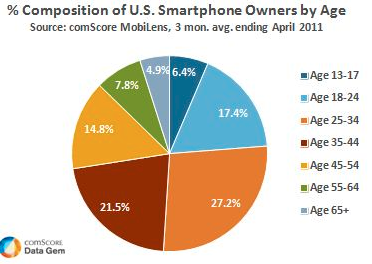 According to the study from comScore, the mobile users within roughly the same demographic account for 36% of smartphone adoption. 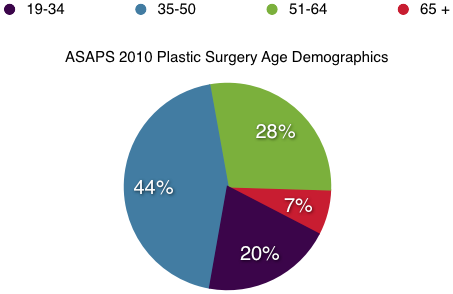 ASAPS found that 20% of the more than 9.3 million cosmetic procedures performed in 2010 fell within the 19-34 age bracket, with smartphone adoption in the same range totaling about 44%. And finally, while those patients over 50 accounted for 35% of plastic surgery procedures, roughly the same group only accounts for about 13% of smartphone adoption. Compare those stats to figures from our recent post, 5 Reasons Mobile Website Design is Essential, and you’ll be better equipped to grab the attention of the mobile user as they search for information on cosmetic enhancement, regardless of age. As you strive to get to know your online patients better, creating an effective and consistent user experience every time they access your site, regardless of how they do it, can increase the overall performance of your website. 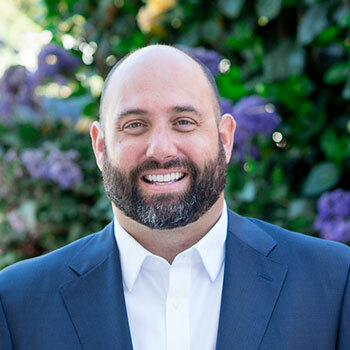 Taking a second to consider the need for compatibility across all channels of your practice’s online presence, be that from a desktop or mobile device, from a PC or a Mac, will ensure your current and potential patients get the information they need, and are able to contact you when they are ready for a consultation. How do these statistics stack up to your practice and patients? Do you have a mobile version of your site, and if so, what has your experience been? Visit the Rosemont Media Facebook page and let us know. Have questions about mobile website design or plastic surgery marketing? Our team actively monitors our Facebook page, so ask away.